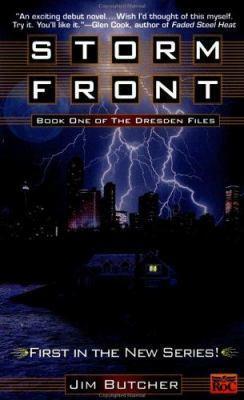 I recently reviewed another book by author Jim Butcher, Brief Cases, which was my personal first foray into the realm of The Dresden Files. That review is posted here. Drawn in by the book of short stories, I couldn’t resist going back for more. In this first installment of the tales of Harry Dresden, modern wizard extraordinaire, Harry is asked to consult on a grisly double homicide by the police department, and at the same time takes on a case of a woman’s missing husband. His investigations are quickly hampered, though, when the killer strikes again. Dresden realizes dark magic is involved in the murders, and that there is a link between the two cases. Before he can discover the identity of the dark wizard who conjured these crimes, he runs afoul of crime boss Gentleman Johnny Marcone, who wants to halt the investigation for his own reasons, as well as the Chicago P.D., and the wizarding governing body, the White Council, who suspect he may be involved in the murders. A physical attack makes Harry realize he is meant to be the next victim, and survival becomes just as important as finding the truth. These two goals will take every ounce of resolve and every bit of magic at his disposal. Butcher skillfully draws readers into a world that combines arcane spells with mundane issues such as car troubles and pizza delivery, and leaves them hungry for more. The author’s first person narrative, reminiscent of noir fiction, moves along at a brisk pace with plenty of action and a matter of fact delivery of the possibilities of magic, tempered only by the character of its denizens. Harry Dresden is a paranormal, urban fantasy hero with skills to rival Merlin, paired with enough angst-filled background to equal The Dark Knight and the lone-wolf sensibilities of gumshoe Sam Spade, right down to his black duster trench coat. All of this wrapped up in a package of a flawed, human nice guy just trying to make a living in modern day Chicago. I award this novel five stars, and recommend this book to any readers who are interested in urban fantasy, paranormal, or detective stories.